We need YOU. If you are interested in joining the team to help preserve the tree canopy in Charlotte, we want to hear from you. There are a number of ways to get involved (list below), and we will be working to add more options soon. Help Plant Trees. TreesCharlotte hosts tree planting events from October to April, with a short break in January to avoid bad weather. Find out when the next planting is scheduled and join us. Get Involved in Your Neighborhood. Are there tree activities currently going on in your neighborhood? Find out by getting in touch with us through the form below. If not, ​nominate your neighborhood for a community tree planting or stewardship event here. Cankerworm banding assistance is also provided to neighborhood groups through the city's Neighborhood Services division. More neighborhood engagement options are anticipated as the implementation of this plan progresses. Become a TreeMaster. TreesCharlotte's TreeMaster program offers a training opportunity for the serious tree enthusiast! TreeMaster volunteers are trained on tree planting and care through outdoor instruction, presentations, and hands-on demonstrations. Graduates of the TreeMaster program become certified protectors of our Tree Canopy and are eligible to help guide future projects. Help Care for New Trees. Sign up as a stewardship volunteer and join a group to care for newly planted trees. Each year thousands of trees are planted during TreesCharlotte events. These trees need follow-up care, especially during the first five years. Stewardship events are scheduled in the fall, winter and spring to mulch, stake and assess the trees. In the future volunteers may adopt sites to keep us up to date on tree conditions during the year. 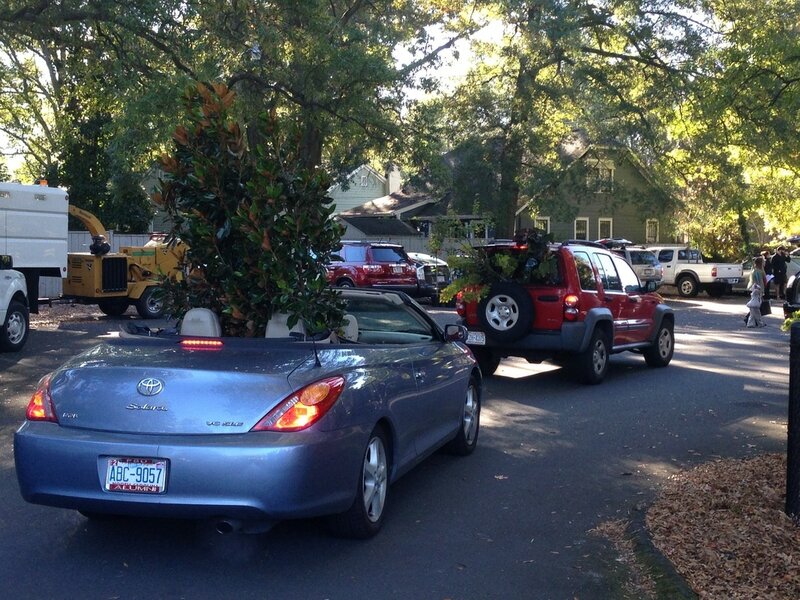 Participants driving off with their new trees as part of a NeighborWoods event. ​If you are interested in getting involved in any of the options above, please get in touch via the form to the left.